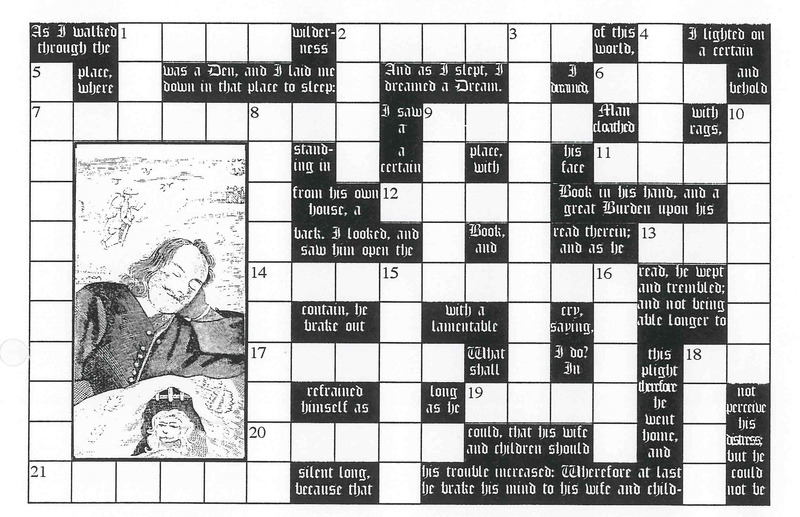 How well do you know John Bunyan’s The Pilgrim’s Progress? Here is a puzzle to test your knowledge. If you can answer less than 10, you should definitely add the book to your reading list soon. If you can answer more than 10, you get a passing score for familiarity with the story. If you can answer more than 20, well done; you get high marks for attention to detail. And if you can answer all 25, you most certainly earn the title of aficionado. Take note: a few answers are from Part 2 of the book. 1. Apollyon threw this at Christian. 2. Christian was seeking to be rid of this. 6. The path to Mount Zion. 9. This Giant lived in a cave at the end of the Valley of the Shadow of Death. 11. This caused Christian to fall into the Slough. 12. The town of Vanity ____. 13. Number of Lions that stand before House Beautiful. 17. Mistrust and Timorous were running from these. 19. Pulled Christian from the Slough of Despond. 20. Stands at the entrance to By-Path Meadow. 1. The place where Bunyan slept and dreamed. 3. One of the Shepherds. 4. Stands at the entrance to the Way. 5. This good man from the town of Sincere was beaten and robbed. 8. This man pointed Christian to the Wicket Gate. 9. The Chamber where Christian slept at House Beautiful. 10. Where Christian was prepared for Battle. 16. Placed through the midst of the Slough. 18. What Christian held in his hand that caused him distress. This is for my musical friends and students. Set aside your word search, Suduku and crossword puzzles. No words or numbers to find here. This is a puzzle to brush up on your music theory skills . . .
Circle all the tonic chords. Circle the dominant seventh chord. Circle all the subdominant chords. Circle all the inverted chords. Circle the b minor chord. The notes that remain spell a ____ ______________________ chord! Double Bonus: If you can play the song with your eyes and guess the title before singing it aloud or playing it on an instrument.